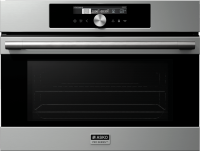 Take the guesswork out of cooking by using the AUTO function in your ASKO Pro Series™ oven. Select any of the pre-programmed dishes, enter the weight of the food you want to cook and the oven does the rest. The AUTO function offers a large choice of preset recipes reviewed by professional chefs and nutrition experts.